Reserve 2 tablespoons of the orange juice; set aside. In 1-quart saucepan, heat apricots and remaining orange juice to boiling; reduce heat. Simmer uncovered 3 to 5 minutes or until most of the orange juice is absorbed. Cool 15 minutes. In small bowl, mix reserved 2 tablespoons orange juice, the preserves and oil. Stir in apricot mixture and remaining salsa ingredients. Heat gas or charcoal grill. Brush chicken with oil; sprinkle with garlic salt. Place chicken on grill. Cover grill; cook over medium heat 15 to 20 minutes, turning once, until juice of chicken is clear when centre of thickest part is cut (170°F). 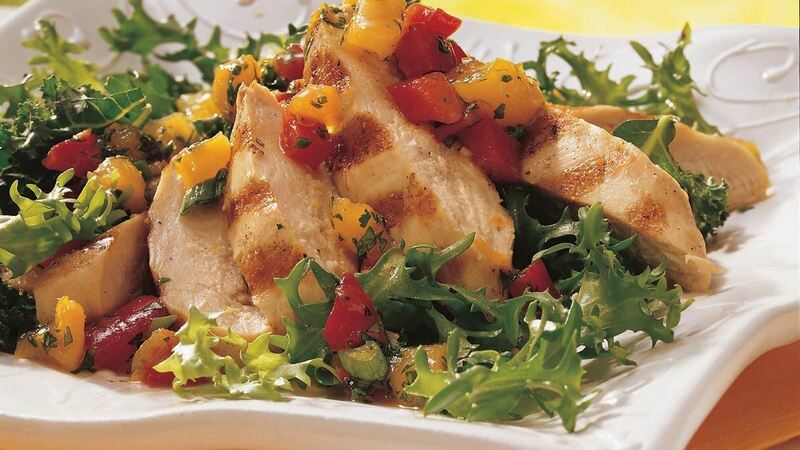 Cut chicken into 1/2-inch slices. Divide salad greens among 4 plates. Top with chicken and salsa. Substitution: Dried peaches and peach preserves can be substituted for the dried apricots and apricot preserves. If apricot nectar is available in your area, it would make a delicious alternative to the orange juice. How-To: To create neat pieces of bell pepper, cut it into 1/4-inch strips. Then line up 4 to 6 strips side by side with the flesh side up, and cut into pieces with a sharp knife. Health Twist: Omit about 4 grams of fat in this recipe by spraying the chicken breasts with olive oil-flavoured cooking spray instead of brushing them with 1 tablespoon olive oil.